Vila Volta is on 8000 m2 with private swimming pool (10x5m) and offers absolute privacy. 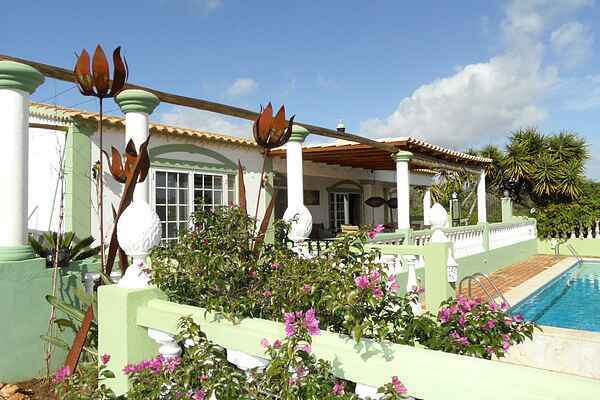 The luxurious, stylishly furnished house is built in Portuguese style, with covered terrace and beautiful views. Ideal for a relaxing holiday. Also a paradise for golfers. Sun loungers and parasols are available on the lockable terrace by the pool. There is also a covered dining area with a fixed BBQ. There is also a jacuzzi. In the comfortable sitting room, with wood stove, there are two leather sofas, three leather armchairs, a flat-screen TV, blue-ray player, radio / CD player and Dutch and English books. The spacious kitchen with large dining table and leather chairs is fully equipped. Vila Volta is suitable for 2 to 6 people, has three spacious bedrooms with air conditioning, luxury beds, wardrobes and each with its own modern bathroom. The villa is quietly situated in the interior of the Algarve, between Albufeira and Portimaô where you will find many restaurants and bars. The nearest beach is only 15 minutes by car. At a short distance you will find a small supermarket and real Portuguese bars. The center of the old fortified town of Silves, with the castle and the Gothic cathedral, is worth a visit. Vila Volta can also be booked together with Casa Volta (ref PT-8365-16). Please note wifi: during your stay 22.5 GB is included, for every extra GB you pay € 1.00.